Canning pumpkin is a great way to add more nutrition to your food pantry. Here is a step-by-step guide to properly canning pumpkin. Canning pumpkin is a great way to add more nutrition to your food pantry. Aside from making pies, pumpkin can be added to cream-based pasta, smoothies, added to baked goods, used in pet treats and more. This plump squash is filled with nutrition as well. 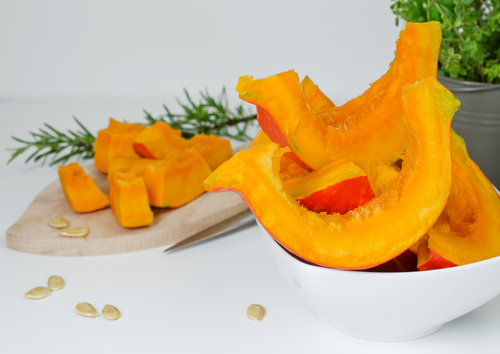 A cup of cooked, mashed pumpkin contains more than 200 percent of your recommended daily intake of vitamin A, which aids in vision, according to the National Institutes of Health. They are also an abundant source of beta carotene and fiber. The best types of pumpkins to use in canning are the smaller “pie pumpkins.” This variety is sweeter and less grainy. Make sure the pumpkins you choose are firm with no bruising or damage on the skin. Bear in mind that a 6-inch pumpkin yields 2-3 cups of puree. An average of 16 pounds is needed per canner load of 7 quarts; or an average of 10 pounds is needed per canner load of 9 pints – an average of 2¼ pounds per quart. This should give you an indication of how much pumpkin you will need. A word of advice, canned pumpkin should be cubed, not pureed. The USDA has deemed pureed pumpkin unsafe to home can due to the denseness of the puree makes it difficult to heat thoroughly enough for the home canner to safely can it. Fit stockpot with a colander or steaming base and fill a pot with 3-4 inches of water. Set heat on medium high to warm water. Meanwhile, cut the tops off of pumpkin and slice in half. Remove seeds and stringy insides. Then, slice into 1/4 slices. When water has come to a boil, add pumpkin slices to a stockpot and cover for 15 minutes, or until pumpkin is soft. Allow the pumpkin to cool and remove the rind with a paring knife. Reserve liquid for canning. Cut pumpkin meat into 1- inch cubes. Return the cubed pumpkin and reserved liquid back to the stockpot and heat the mixture through again. Boil for 3-5 minutes and set aside. Fill sterilized jars with cubes and cover cooking liquid, leaving 1-inch headspace. Remove air bubbles, wipe rim and process in a pressure cooker for 55 minutes for pint jars and 90 minutes for quart-sized jars.